FotoBella: You can now cut Fabric with your Silhouette! You can now cut Fabric with your Silhouette! CHA was great this week. One of our favorite new things is the Fabric Interfacing for the Silhouette! You now can cut fabric with your Silhouette SD or original Silhouette machine! FotoBella just got our order and have it in stock ready to ship! There are two types of fabric interfacting available. Silhouette clean cut interfacing has a stronger adhesive for a cleaner cut and less fraying over time. Use clean cut interfacing for projects that don't need to be washed or that can be hand-stitched. Contains 17" x 36" of interfacing. 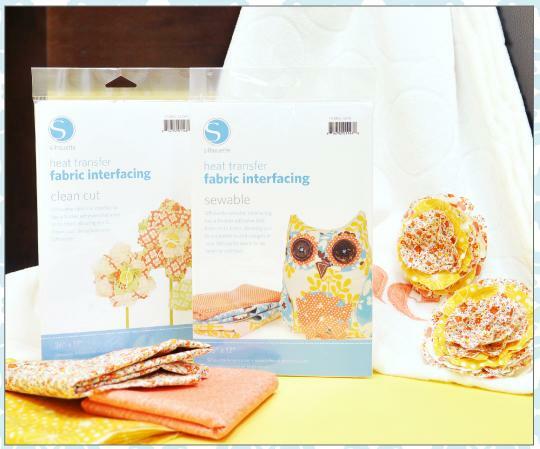 Silhouette sewable interfacing has a thinner adhesive allowing you to temporarily iron your cutout designs to your project while you sew or stitch them. Contains 17" x 36" of interfacing. Try it out and share your project on our Facebook page!